I regularly speak with customers that are looking for a solution to display live video from a security camera on a TV or HDMI monitor. Unfortunately, BNC security cameras do not natively output an HDMI video signal. The good news is that that there are reliable and affordable HDMI conversion adapters for all BNC type security cameras, including SDI, HD-TVI, AHD, HDCVI, analog CCTV (CVBS). In addition, just about every video resolution for all of these video formats is also supported, including CIF, D1, 960H, 720p, 1080p, 3 megapixel, 4 megapixel, 5 megapixel, and 4K (8 megapixel). 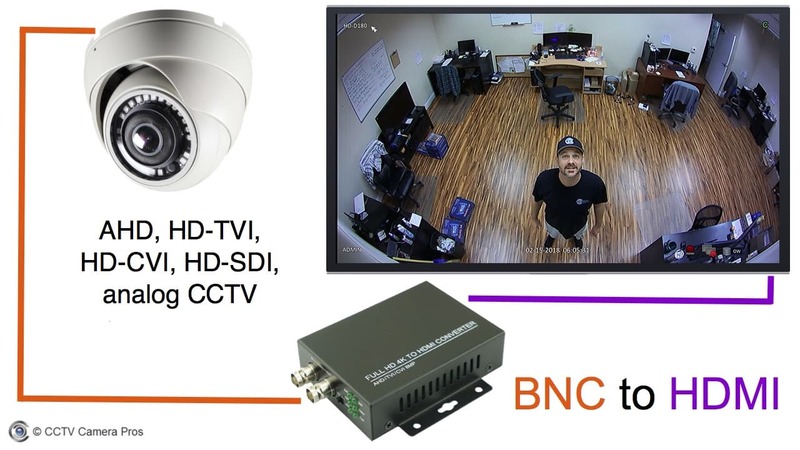 Here are the 5 solutions for all of the different types of BNC security cameras that are available. You can click on any of these links to jump to a section. Or you can start with the overview of how BNC to HDMI converters work. How do BNC to HDMI Converters Work? 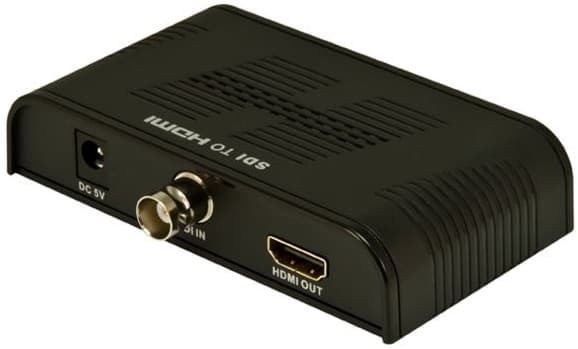 A BNC to HDMI converter takes video input from a security camera (or other video source) via a BNC input, transforms the video to HDMI format, and outputs the video signal via an HDMI output port for display on a TV monitor. The above diagram shows how simple it is to install an HDCV-3-T BNC to HDMI converter. This is how it works. The orange cable that connects the surveillance camera to the converter box is 75 Ohm coax cable. RG59 Siamese cable is by far the most popular cable for all BNC security camera types, but RG6 can also be used. If you are using a raw spool of RG59 cable, a male BNC connector must be attached to both ends of the cable run. These crimp-on style BNC connectors are the most popular and that page contains a video on how-to cut, attach, and crimp them on to cable. Notice that the HDCV-3-t converter that is used in the diagram has two BNC connectors. One is the BNC input that the camera connects to. The second is a loop output. The loop output can be used to connect to another device (including a second) HDMI converter if you want to display live video on a second monitor. Please note that not all converters have a BNC loop output. The purple line represents a standard HDMI cable that runs from the HDMI video output of the converter box to the HDMI input on the TV or monitor. The converter box comes with a 12V DC power supply which is not pictures in the diagram. AHD stands for analog high definition. AHD security cameras are sometimes referred to as HD-CCTV cameras. If you are not familiar, please read my article “What is AHD?”. 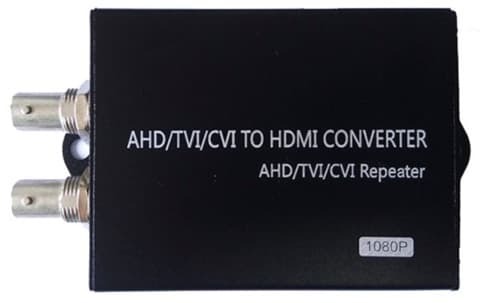 The HDCV-3-T that was used in the above “how they work” diagram supports AHD to HDMI conversion. It supports the following AHD video resolutions: 720p, 1080p, 3 megapixel, 4 megapixel, and 5 megapixel. The AHD-CV7 (pictured directly above) is another AHD to HDMI converter that I highly recommend. In addition to the HDMI output, the AHD-CV7 also has a VGA output so that it can be used as an AHD to VGA converter. The HDMI and VGA output can actually be used at the same time to output video to two different monitors. The AHD-CV7 is compatible with 1080p and 720p AHD security cameras. HD-TVI stands for High Definition Transport Video Interface. It is another HD security camera video format that runs over 75 Ohm coaxial cable, like RG59. The HDCV-3-T TVI to HDMI converter works great. It supports the following HD-TVI camera resolutions: 720p, 1080p, 3 megapixel, 4 megapixel, 5 megapixel, and 4K / 8 megapixel. Please note that regardless of the resolution of the video input, the HDMI output is always 1080p. SDI stands for serial digital interface. SDI supports multiple sub-formats that produce different video resolutions, such as SD-SDI, HD-SDI, dual link HD-SDI and 3G-SDI. HD-SDI stands for high-definition serial digital interface and became a popular video standard used in security cameras around 2008. 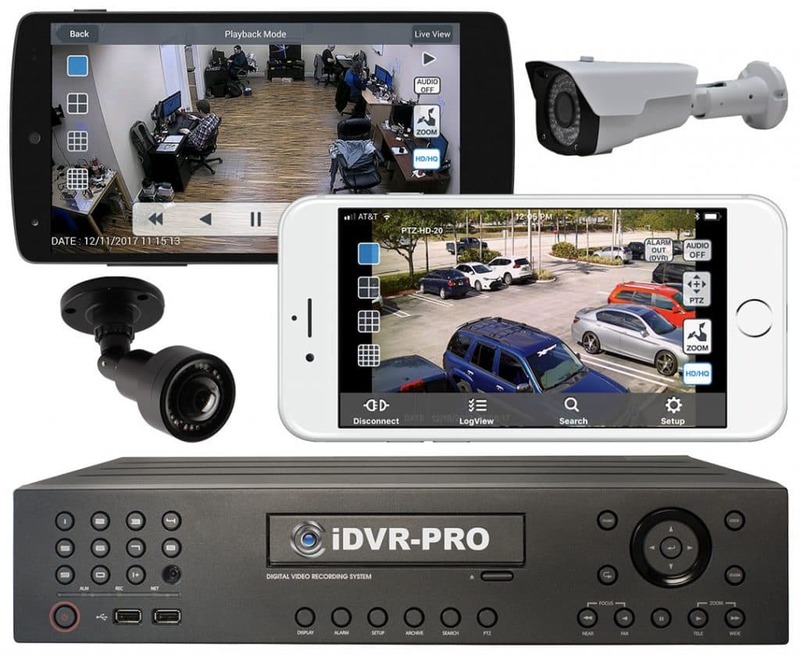 HD-SDI security cameras are still used in 2019, however, they are much less popular since AHD and HD-TVI was invented. The SDI-CR1 SDI to HDMI converter works great with the following SDI formats: SD-SDI, HD-SDI, and 3G SDI. These resolutions are supported: 720p/50Hz, 720p/60Hz, 1080i/50Hz, 1080i/60Hz, 1080p/24/25/30/50/60Hz. It has a single BNC SDI video input and one HDMI output. 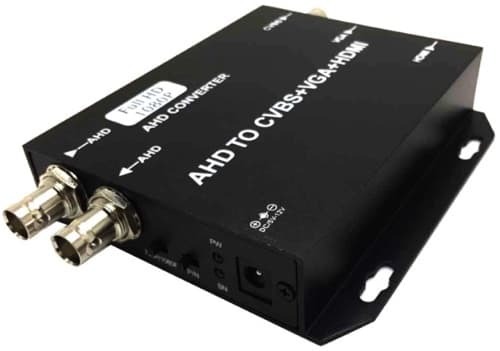 The HDI-CR1 does not have a BNC loop output like some of the other converters do. Analog CCTV cameras (CVBS) have been around for decades. They have evolved a lot over the years and are still in use today. Although, HD security cameras are replacing them more and more. I have found the VM-HD4 4 channel HD CCTV multiplexer is a much better value than any single channel CCTV to HDMI converter on the market. In case you re not familiar with what a video multiplexer does, it combines the video signal from multiple cameras and lets the user control different video layouts including single, dual, and 4 camera layouts. Here is the back of the VM-HD4. It has 4 BNC video inputs, 2 analog BNC video outputs, 1 HDMI out, and 1 VGA out. The HDMI and VGA output 1080p HD video. 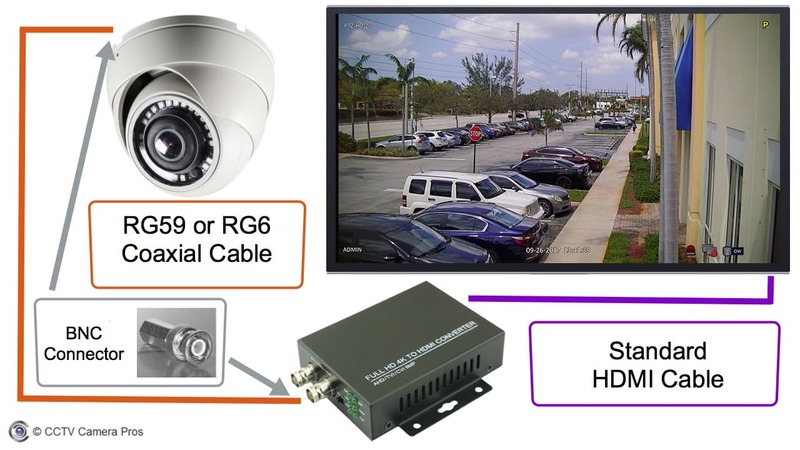 With a single CCTV camera connected to the VM-HD4 and the video display output set to the single camera view, this video multiplexer is essentially acting as a CCTV to HDMI converter. With the VGA output, this device can act as a BNC to VGA converter. Here is a single camera view captured from the HDMI output of the VM-HD4. Here is the 4 camera quad view of the VM-HD4. When users use this multiplexer with more than one camera, they can switch between screen layouts using the wireless remote control that is included. You can see additional screen layouts that are supported here. The HDCV-3-C is an HD-CVI to HDMI converter that is compatible with 720p, 1080p, 4 megapixel, and 4K (8 megapixel) HD-CVI security cameras. This is the same product as the HDCV-3-T. 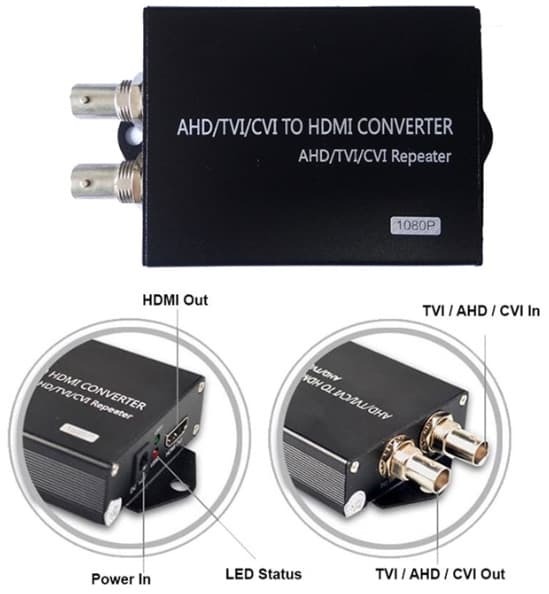 Both of these converter boxes are compatible with HD-CVI, HD-TVI, and AHD cameras. Every coax cable and BNC based security camera uses one of the video standards discussed in this article (AHD, HD-TVI, HD-CVI, SDI, analog CCTV / CVBS). Some manufacturers try to hide the video format that their cameras and DVRs use so that customers believe that they must buy additional equipment only from that manufacturer for it to work properly. This could not be further from the truth. My company, CCTV Camera Pros, does the opposite. We believe in 100% transparency and we document technology as thorough as we can. We want customers to be properly educated so that they can make the best decision when shopping for a security equipment supplier. 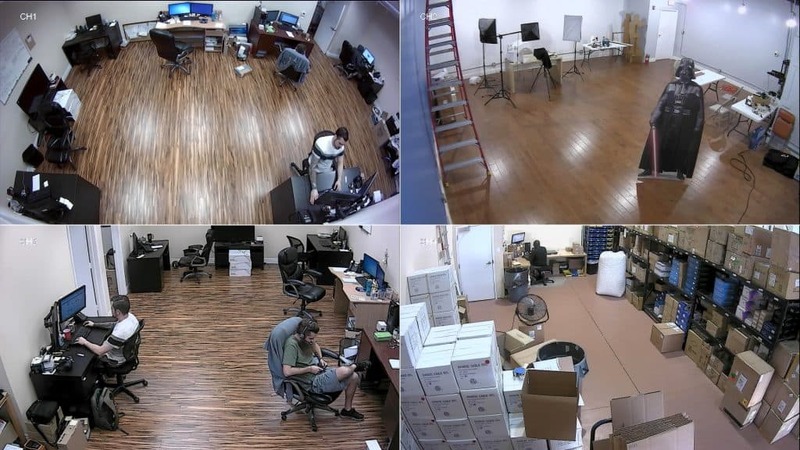 In addition to the converters discussed in this article being compatible with cameras from CCTV Camera Pros, they are also compatible with surveillance cameras from all other manufacturers including Samsung, Lorex, Night Owl, Swann, Samsung, QSee, Defender, and more. 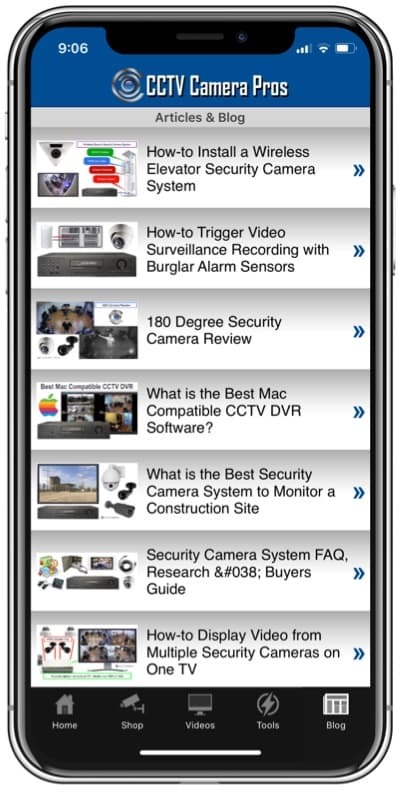 If are having trouble determining what type of security camera you have, please contact me here via email. Here are some related article that you may be interested in.